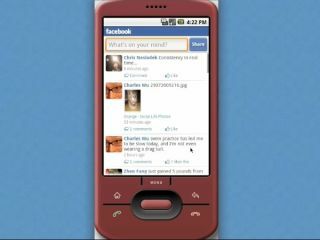 The official Facebook application for Android has been unveiled, with some users a little upset at the lack of features. It gives users the basic things from the social-networking site, like news and status updates, and also allows users to put an application on the hom escreen to call up to 125 numbers from their phone book. However, it's not the all-singing, all-dancing application we've seen from the iPhone efforts, as there's no messaging or chat on board. There is the opportunity to upload pictures via the application though, and while some users have reported slight bugs (mostly in non-English speaking territories) the developers have quickly fixed that problem and now the interface is apparently very slick. However, there has been some confusion over whether this is the official application for Android from Facebook. The Android Market lists the developer as Facebook, and the Facebook page states "This application was not developed by Facebook." But TechCrunch is reporting it has spoken to the developers, and Google has apparently developed an application with Facebook's blessing. Why the huge site couldn't do the application for itself, we don't know, but obviously the Big G wanted an app so bad, it couldn't wait. It's up in the Android Market now, so hop over on your Google phone and check it out.